The first four days of racing in the books, and the early leaders are jockey Ramon Dominguez and trainer Anthony Dutrow. Dominguez tied John Velazquez’s record for most winners on one card when he won six races on Sunday; he’s got 10 wins for the meet. Jose Lezcano’s in second place with six. Wednesday, July 25: One of my favorite races, the Grade II Lake George, won recently by Winter Memories, Perfect Shirl, Rutherienne, and Film Maker, is the mid-week feature. In 1996, Winter Memories’ dam, Memories of Silver, won it, and one of my best memories from last summer was talking to owner/breeder John Phillips and trainer Jimmy Toner about it. If you don’t believe that jockeys are athletes, watching them play basketball will be sure to change your mind. The jockeys shed their silks and don shorts to raise money for the Race Track Chaplaincy in a charity game at 7:00 at the Saratoga Rec Center at 15 Vanderbilt Avenue. The Chaplaincy helps fund back-to-school programs, a summer enrichment program, a camp and child care for Saratoga backstretch workers, and recreational opportunities through the year. Sponsors for this year’s game include Winstar Farm, The Jockey Club Safety Foundation, NYRA, Masters Private Client Group, Daily Racing Form, New York Thoroughbred Horsemen’s Association, David Donk Racing Stable and Todd Pletcher Racing Stable. For more information, contact (516) 835-0275 or email RTCANY@aol.com. Thursday, July 26: This September, the National Steeplechase Association will hold its inaugural Saratoga festival meet on September 15, and after the first race Thursday, the organizing committee for the event will unveil its official painting. Painted by artist Sharon Crute, the painting will be auctioned off the night before the September races to benefit the Thoroughbred Retirement Foundation. Self-promotion alert: I wrote about the Steeplechase festival in the summer issue of Saratoga Seasons magazine. Friday, July 27: Saratoga’s version of twilight racing means a post time of 2:30, and it’s College Day at the track. All college students will receive free grandstand admission with a valid college ID and have the chance to win a $1,000 scholarship after each of the day’s races, courtesy of NYRA, along with other prizes such as iPods, iTunes gift cards, and restaurant gift cards. Additional scholarships will be offered by the New York Thoroughbred Breeders, Inc. (a $5,000 scholarship to a student enrolled in an equine program at a New York State school); the New York State Thoroughbred Breeding and Development Fund (six scholarships of $2,500 to students who will be pursuing careers in New York State’s Thoroughbred racing or breeding industries); the University of Arizona’s Race Track Industry Program ($2,000 in additional scholarship money for students accepted into its track management program); and the Race for Education ($1,000 scholarship). Beginning at noon, students may register to win the scholarships and prizes at the Big Red Spring located in the backyard. The first 1,000 students to register will receive a commemorative College Day T-shirt. Track goers of all ages are encouraged to wear their alma mater’s colors or favorite collegiate team’s gear for the chance to win special prizes throughout the day. Activities for younger kids will be available at the track’s Family Fun Fest, which will take place each Friday at the track. In the backyard playground from noon to 4 p.m., families will find including a bouncy inflatable and the Tiny Tots Tea Room arts and crafts table. Young racing fans can also have their day at the races commemorated with a special photo magnet. Family Fun Fridays include adult grandstand admission, a Post Parade program, a hot dog and Coca-Cola for $5 with a voucher found on Coca-Cola displays at participating retailers. The voucher can be redeemed at the reserved seats office on Union Avenue on any Friday during the season. 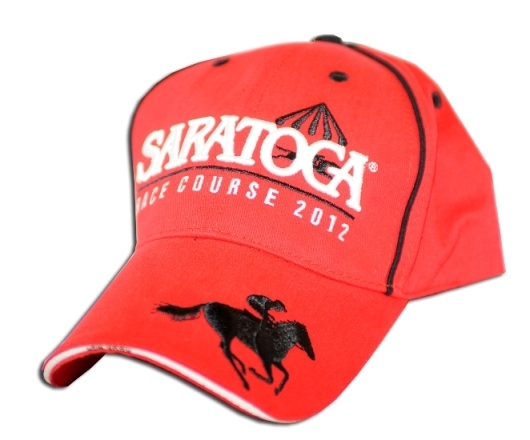 Admission to Saratoga Race Course is free for children under 12 when accompanied by an adult any day of the meet throughout the season. The fourth Curlin Stakes will be run Friday, and Barbara Banke of Stonestreet Farms will be at Saratoga to announce the name of 2009 Horse of the Year Rachel Alexandra’s first foal, sired by Curlin, 2007 and 2008 Horse of the Year. The announcement will be made after the Curlin is run. 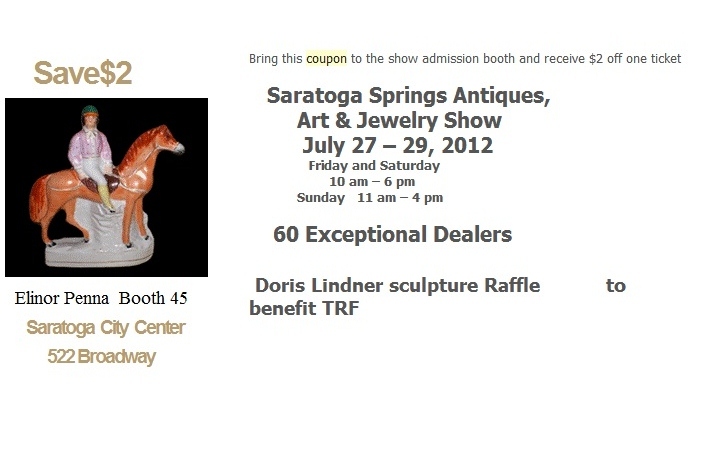 July 27 – 29: The Saratoga Springs Antiques, Art, and Jewelry show will be held at the City Center. Admission is $10, and attendees will find ceramics, fine art, jewelry, furniture, and home accessories among many other items. A special exhibit will highlight the influence of the horse in art throughout time, and a raffle of a Royal Worcester horse figurine by Doris Lindner will be held to benefit the Thoroughbred Retirement Foundation. The figurine was manufactured in 1973, and, #124 of a limited edition of 750, its retail value is $1,500. On Wednesday, my Saratogian column will feature Elinor Penna, widow of Hall of Fame trainer Angel Penna; she’s gone from racing to the arts and will be at the show with her collection of Staffordshire porcelain. Mention Brooklyn Backstretch for a 10% discount at her booth, and bring this coupon for $2 off the admission price. Saturday, July 28: One of Saratoga’s most anticipated days of racing features the Grade II Jim Dandy and Grade I Diana. This racing fan is looking forward to the Winter Memories/Tapitsfly rematch in the Diana. Sunday, July 29: At 10:30, join Gloria May for a tour of Greenridge Cemetery, whose inhabitants include racing luminaries James Marvin and Samuel Hildreth. The tour will start at the Lincoln Avenue entrance and is $5 for members of the Saratoga Springs Preservation Foundation, $8 for non-members. Click here for more information. At the track, fans can line up to get the first giveaway of the meet, a baseball cap, while supplies last; the feature race is the Grade II Amsterdam. Author Anne Hambleton will be at the booth outside the silks room to sign copies of her young adult novel Raja. Hambleton tells the story of a promising 2-year-old racehorse whose path to racing success is not the smoothest; check back here Thursday for a post about her and her book. Hambleton will donate 20% of the proceeds of the day’s sales to the Thoroughbred Retirement Foundation. Monday, July 30: Today’s the deadline for submitting your track photos to the Times Union photo contest. The contest winner will receive two tickets to the paper’s Galloping Grapes wine tasting on August 5. At the track, the Caress Stakes will be run at 5 ½ furlongs on the grass for fillies and mares, three and up. Wednesday, August 1: Two author signings at the National Museum of Racing and Hall of Fame, from 10 a.m. to 1 p.m. Patrick Smithwick, son of Hall of Fame steeplechase jockey Alfred P. Smithwick, will be signing copies of his memoirs about life on the track, Flying Change and Racing My Father. He’ll be joined by Anne Hambleton, author of Raja (see above). The John Morrissey Stakes for New York-breds is the feature race. While much of the talk will focus on Spa City as a resort, attention will also be directed on the parts of the city seldom discussed. “I’ll talk about John Morrissey, a Troy street kid and river rat, who rose in the world through his fists and his politics to become an exalted gambler courted by the New York elite and who brought the casino and the track to Saratoga. I’ll talk about latter day gamblers and mob figures who moved into Saratoga — Arnold Rothstein, Meyer Lansky, Lucky Luciano — how it was all linked to politics, and how a politician — Governor Thomas E. Dewey — closed it down,” Kennedy said. Hm. A New York State governor getting involved in Saratoga gambling. Imagine. Thursday, August 2: Equine Advocates holds its annual awards dinner and fundraiser at the City Center. This year’s honorees are Thoroughbred owners and breeders George Strawbridge and Roy and Gretchen Jackson, and jockey Edgar Prado. Tickets are $250. Sunday, August 5: More support for racehorses at the Thoroughbred Retirement Foundation dinner and fundraiser, honoring Thoroughbred owner and breeder Ogden Phipps. Tickets are $350 and the event will be held at the City Center. And every day through the meet (except for Travers day), up to six racing fans can join Tom Durkin in the announcer’s booth for the third race. Donations of $100 per person go to Backstretch Employees Service Team. For reservations, call 518-587-3720. Thursday, August 9: Join the New York Yankees’ Mariano Rivera at the restaurant of which he is a part-owner to raise money for his foundation, which supports children’s health, education, and wellness. Siro’s Trattoria at the Lodge is hosting the event; tickets are $500 per person and be purchased by calling 516 355 4514. Wednesday, August 22: Join the Belmont Child Care Association (on whose board I serve) for its annual fundraiser to support Anna House and the children of the backstretch. More details to follow. Never a dull moment at Saratoga! Enjoy! Guessing that Andy Cuomo is not a member of the Saratoga Springs Preservation Foundation. William Kennedy will probably tell you The Travers could have been named The Morrissey. Thank goodness it was not! I never would have been able to slip the name Morrissey past the mare! Great post as usual Teresa. Sounds like you are working very hard in the Spa City this summer. Make sure you have some fun. Man, this sounds like so much Fun!!! I am gonna get to Saratoga one summer and visit the Hall of Fame and museum too!! Where is there reasonable priced lodging near by and can you by one of those cool hats if you can’t make it there for the giveaway? Hope everyone has a great time that gets a chance to go. People can say racing is dead but when I read stories like this and see that 47K plus people turned out on a weekday on the west coast for opening day at del mar it gives me hope! Thanks for the weekly updates on things to see and do around town – lots to consider and to enjoy! I have no doubt you’ll mention it in your Saratogian piece, but Mrs. Penna also was a ground-breaking and very well-regarded sportswriter in her own right before becoming involved in racing, marrying Mr. Penna and moving on to the art world. Some of us are old enough to remember reading her work back then (when we were just young neophytes, of course). Look forward to reading your coverage of her latest pursuits. Planning on making a special trip up for the Steeplechase day in September. On my first visit to the Spa, a Thursday (?) in 1975, two jump races were carded. I think having the Steeplechase races marginalized as they’ve been detracts from the Saratoga experience. Just my two cents. Hoping the whole affair is a rousing success, and is gifted with a spectacular late summer day. You really owe it to yourself to make it happen. It’s pricey in town, but there is no shortage of nice places to stay in the area. I often stay in Lake George, a twenty minute drive up the Northway. Yuwipi, I may try to make that festival, too — will depend on what’s going on at Belmont, but would like to be there. Jarrod, I second the encouragement to come up here. It’s not inexpensive anywhere, but Latham and Clifton Park are much more reasonable than Saratoga. Leslie, I’ve had the pleasure of meeting Elinor several times; it was a treat to hear her stories and write about her.